The city of Cusco is characterized by its history, culture, architecture and by its faith, that is declared in the great quantity of churches, temples and convents along its streets. The main church of Cusco is the Cathedral, also called the Cathedral Basilica of the Virgin of the Assumption, and harbors the Diocese of Cusco. The Cathedral of Cusco is found on one of the streets of the main square of Cusco and is, without any doubt, gives the notable and most attractive buildings of America, product of various projects. 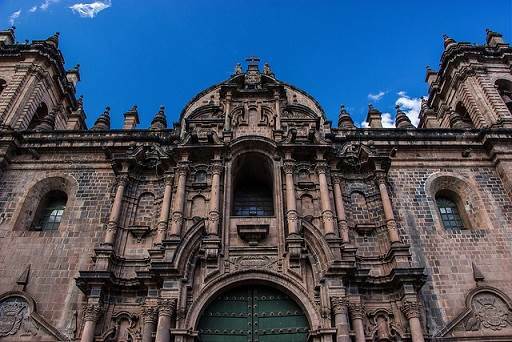 The first cathedral built in Cusco was the Iglesia del Triunfo in 1539, that raised its foundation on the base of what was the most important temple of the Inca era, dedicated to the God Wiracocha. At present, the Iglesia del Triunfo is a chapel that is auxiliary to the Cathedral of Cusco. The Cathedral, was built in 1560 and finished being build in 1668, having had the luck to not have had the same outcome, as the other churches and temple, of the earthquake of 1650. Its construction was in charge of Juan Miguel of Veramendi in 1560, who was replaced by Juan Correa in 1562, and substituted by other various teachers, and finally, taking charge of the direction of this work Miguel Gutiérrez Sencio in 1615. On February 8, 1928 the Cathedral of Cusco was declared as the Basilica Menor of the Catholic Church. The Cathedral of Cusco, was built with stones originating from nearby zones; besides, reddish tone granite blocks were reused taken of the fortress of Sacsayhuamán. It has been built on a platform whose form is that of a latin american cross and is conformed by five sections of Basilical style. It has on two auxiliary chapels, that flank it to each side, -El Triunfo, and Jesus, María and José-, and presents a plant-parlor of three ships with two sections of lateral chapel and wall flat front. Also, in its architecture we can find vaults that are of gothic architecture; its high Altar, silver; and its lateral chapels, that are surrounded by golden grilles and coronations with allusive sizes to the regular dedication. On the side of the epistle (right), the altar of the Señor de los Temblores can be found, the Virgen de los Remedios and the Chapel of the Plateria, whose more prized piece is the immense silver pavilion that serves as processional walks for the Corpus Christi, presented by the bishop fray Bernardo de Serrada in 1731. On the side of the Gospel (left), the chapel of The Virgen Immaculada Virgin can be found (”The Pretty one”) and that of the apostle Santiago. The seating of the chorus of the Cathedral, is found located in the main side and in the retrochoir there are also some chapels, as that of Nuestra Señora de la Antigua, while the exterior sides have been decorated with the paintings of Basilio Santo Cruz on the Virgin of Belen and the Virgen de Almudena. The Sacristy, is one of the most luxurious and most decorated precincts of the Cathedral, therefore presents an assembly of paintings from to the middle of the 17th century of Marcos Zapata. For all this and more, the Cathedral is a place you must visit during yof in transit our stay in Cusco, you will therefore remain captivated by this beautiful and enigmatic construction.